seems to be stuck in reverse? 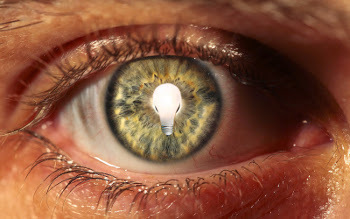 Your Brain Into An Idea Generating Dynamo! Do you sit and stare out of a window trying to get ideas that will change your life? Millions of people do the same thing. Know that you are not alone. You sit and think, sit and explore, go get a cup of coffee, sit and think some more, get another drink (maybe something stronger this time), and finally say to yourself . . .
"I'll have to come back to this one later." So, the good news is. . .
evaluate new ideas whenever you want or need them. I never knew that I had "Idea Deficit Disorder"
I took a class that was in the "Graphic Arts" department. This class was about learning how to create and develop ideas to solve problems. That class changed my life, and how I look a things in my life today. One of the projects that I was faced with was coming up with 100 ways to use ball bearings. Everyone had something different, such as hair pins, and rubber bands. I drew the straw for ball bearings. Can you come up with 100 uses for ball bearings? I did. Another project was to take an ordinary piece of typing paper and make something that would fit around a light bulb so that when the light bulb was dropped from a height of 6 feet, it would not break. No tape, no staples, just that plain piece of typing papter. Many of the ideas did not work - mine did. another, I was taught that there is a method for making the ideas happen. 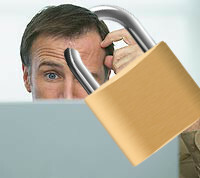 Open the idea door of your brain and let those ideas free? 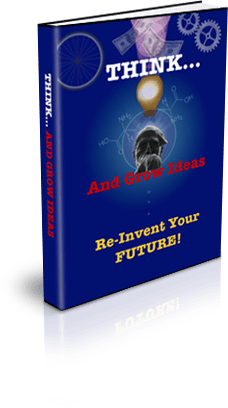 Generate creative ideas in minutes and not days? Learn 3 super-easy techniques to create ideas that solve problems? Stop wasting time looking out of that stupid window? I Took Classes, Researched, and Developed a System . . . THAT WORKS! I had no clue that I was "Idea Impaired" until I took that one class. I was astounded at what I was learning. You may not even realize that your idea generating mechanism may need an overhaul, or at the very least a bit of tweaking. I have worked with businesses, athletes, and many students to help them create and define ideas to help their performance levels grow exponentially. There is almost nothing that you cannot accomplish if you understand how to generate the necessary ideas, build that idea into a concrete concept, and then make that idea a reality. The amazing thing is that you may doing some of the things that I teach already which will put you way ahead of most people. I will show you why those "Things" are working, and how you can improve on them. 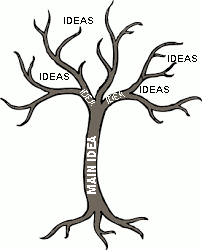 Ideas are like the branches of a tree. One idea will generate another, and another - when you understand how. Don't let another possible idea go to waste. Generating ideas is not something that just happens. By following this step-by-step path to your idea tree, you can generate an idea very quickly, and when needed, not when it decides to just "Show up" on it's own - like 3 o'clock in the morning. Flip Your Idea Switch To "ON" - Learn how to trigger your mind so that it will release and respond to idea generation. Increase Your Productivity - Increasing your ideas, increases what you are able to produce, which will increase your productivity and your sales. Aren't you tired of trying to beat through that brick wall - with your head? It's about time to give your poor head a break, and instead, break through that brick wall to capture all of those ideas that you have been missing all of this time. No one is going to tell you what to do, but if you do nothing, then you are sealing your fate, and are certain to continue on your path to having nothing better than you have right now. Unless you actually decide to change something, nothing is going to change. Things may (and will) change around you, and you will have absolutely no control over anything. WHY? Because you have failed to act on anything. Ideas are what will take you from Zero, to creating something very special. Make your life easier - Make more money, work fewer hours, and create a better lifestyle with your ideas. people's lives for the better. You will be thanked. Get a raise in pay - Add more value to your workplace. You can be of great value to an employer with innovative ideas. You know that you have had ideas that would make things go more smoothly for yourself and others at work. Quit your job! - Ideas are what creates wealth. Facebook, Microsoft, Google, even the "light bulb". These all began as ideas that blossomed into greatness. Your ideas can be great too. Give prosperity - If you have a family, or are planning on one, then you definitely want to give you family the best that you can provide. All it takes is just one idea. My name is Robert Bates. What I have put together was a life saver for me. My friends and family will tell you that I was a real floundering mess at one point in my life. I did stare out of windows a lot, wasted most of my time, and could never quite "Figure it out". Then I took a class in college, and it sparked something. I did more research, figured out less complicated methods for making ideas show themselves, and finally put things together. Since I had little faith in myself or abilities, and because I had done nothing, been nothing, and had nothing for so long, I continued to sit and stare out of the window wondering when my life would change - it didn't. One rare day when I became motivated to clean, I came across all of this research that I had done on ideas, what they were, and how to more easily make them surface so that you don't need to go digging for them. Something sparked again. I started to use it. When things actually worked, people began to take notice, asking "What's happened to you? You're really different". I was different. My ideas helped me to graduate with a master's degree in Performance Psychology, have a successful business, and now I can help others like you to use these same techniques to improve your life. Learn to identify, control, or eliminate those stressors that plague your daily existence. 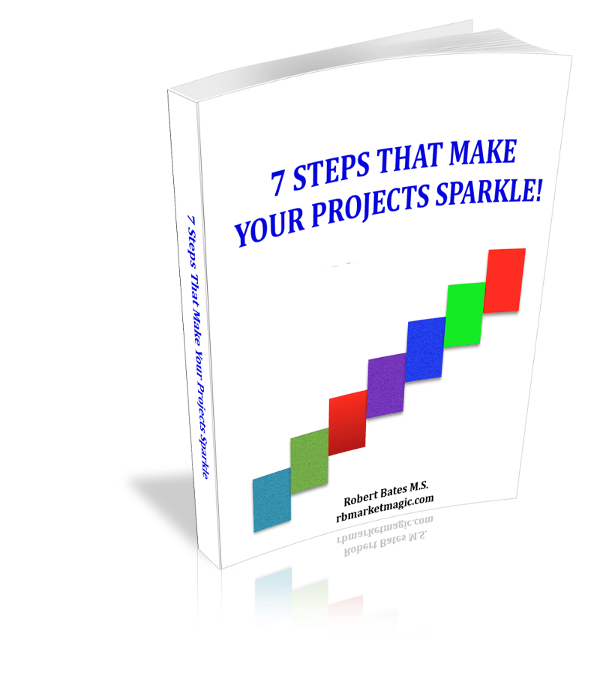 "7 Steps That make your projects SPARKLE!" and to keep you on track. ﻿HERE IS WHAT YOU WILL GET. . .
You have ideas every day.  There are times when you need more thorough thinking, and that is when it is important to know how to use the basic principles of getting the most ideas created, in the shortest amount of time possible. You use ideas each and every day. Whether you are at work, at home, or even on the golf course, you are always trying to generate ideas. You probably create life-changing ideas every day, but just don't realize it! Once you get this information, you will find that you can use these proven principles to come up with new ideas when you need them. "Think and Grow Ideas" will take you to that next level that you always hear about, but never seem to reach. Remember, this. . .
your ideas are your life! Now is your chance to make one of those life-changing decisions. You can just sit there on the fence and continue to think about making a decision that you will never act upon, or you can get started creating those ideas that you wish you had done a long time ago. 1 - year, money back, guarantee. Now you can test drive our product for one full year with NO RISK! I take all of the risk out of your decision. Once you understand how to jump start that part of your brain, you know, the part that comes up with all of the really good stuff that you think about each day. As usual, you never have anything to write with, or you are driving and can't write. Now you will be solving your problems on your schedule and on time. Your full year guarantee takes all of the worry out of your purchase. P.S. This price is only good short-term! Why should you get this now? 1. You may not ever see this offer again (not at this low price). 2. The price will be higher if you see it later. 3. How often do you come back to offers? NEVER!